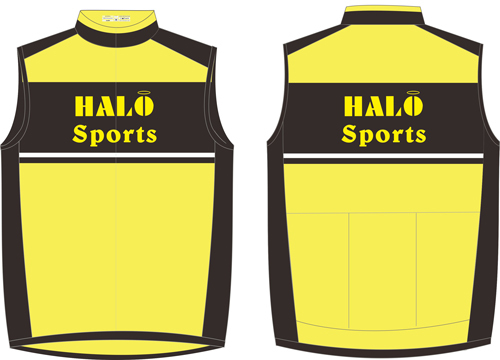 The short sleeve jerseys take advantage of the following materials, honeycombe, spitech light, and satin. A very light material in smooth polyester fibre, developed to eliminate all types of skin irritation. Its water resistant nature means it will dry quickly once wet. Furthermore, sweat, in contact with turbulent air, will dry quickly instead of dampening the jersey, thus leaving the skin dry. The characteristics of the Honeycombe weave/braid lends the material a lighter density in respect to other comparable materials. Optimum breathability. A Microfibre material of small square appearance, with an extra shine finish. Ideal for Summer wear. Very good visibility. A new micro fibre developed for summer clothing. Thanks to its particularly fine weave the material assures optimum visibility. Softness and elasticity are guaranteed. Adapted to create an extra shine for designs with strong and bright colours. We offer long sleeved jerseys as well, using the spitech plus materials. A Microfibre material of small square appearance. Ideal for Spring/Autumn wear. Very good visibility. 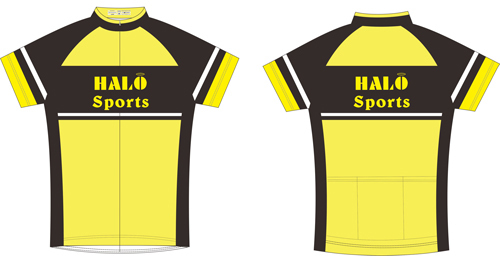 Suitable: Autumn/Spring Cycling, Winter/Spring/Autumn Orienteering and Running. Our gilet’s use the light windtex material, detailed below. 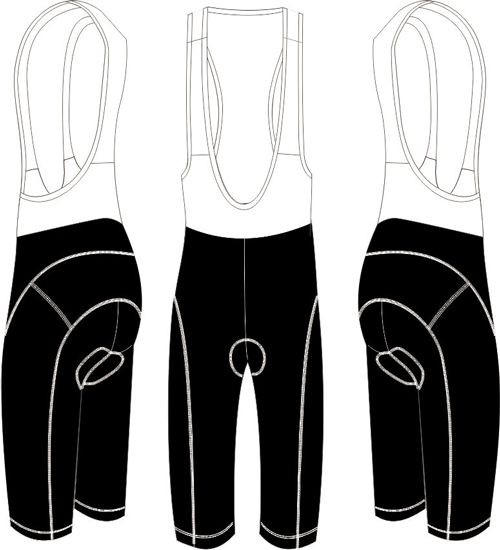 Our cycling shorts, and bibshorts both use the lycra materials, again detailed below. A material that allows freedom of movement, comfort and close fitting, while maintaining shape and preventing creasing. Garments in this material have a streamlined look, adhere to the body without interfering with movement, are comfortable and look attractive. Technically Lycra belongs to the category of synthetic elastam (elastic) fibres, a segmented polyurethane ie. It is composed of a flexible sequence of segments joined to rigid segments. Lycra can be stretches 4-7 times its normal length, but immediately returns to its shape as soon as the stretching is relaxed. Though the fabric looks like a single continuous yarn, it consists of a bunch of thin fibres. 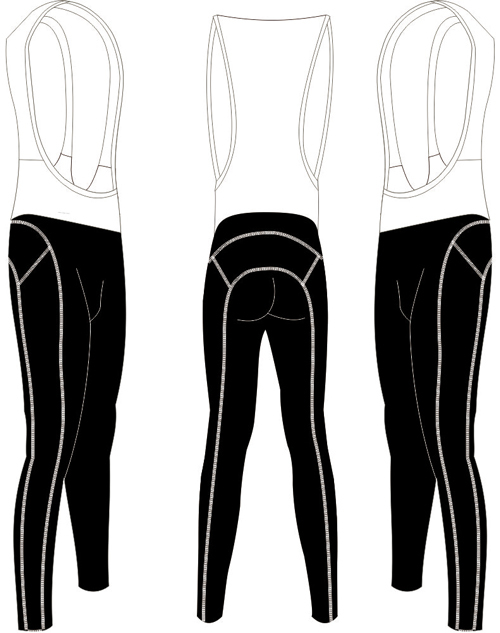 Lycra is always combined with one or more natural or synthetic fibres. Suitable: Year Round Cycling, Triathlon, Spinning. 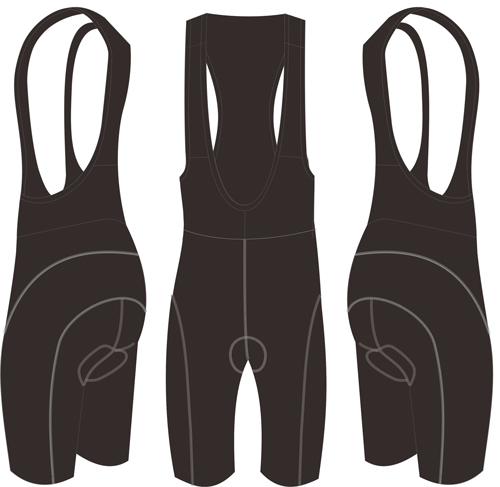 Our 3/4 length bibshorts again use Lycra, but also available in superroubaix materials. A double elasticised fabric with technical-tactile characteristics. It is used in active sports. Its appearance is opaque, it has plush on its reverse, it wears extremely well and it has a superior elasticity which makes the garment superior to similar ones on the market. The sophisticated process and use of special fibres make it pleasing to the touch. It has unmatched qualities and is long lasting. A special material for special garments. The bibtights are available in only superroubaix materials.